Isn't he just too cute??? Kim Teasdale is hosting the OCC Challenges for the month and today's challenge is a sketch and I always love a good sketch challenge. And guess what!!!! 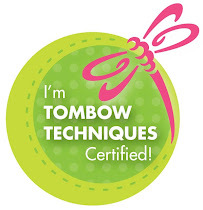 They have a give-away for participating from Clear Dollar Stamps. So in honor of this, I knew I had to pull out this way too cute moose!!! He was a lot of fun coloring. I tried using re-inkers on the moose - couldn't do any more of the image using them because I only have a few re-inkers (they're on my wish list - now if only I could win the lottery). I've had these DP's sitting out for awhile waiting for a card to use them on and I think they worked out perfectly. Notice I didn't use a scallop mat on my card today? Guess what - this was the first time I had pulled out the small oval nesties and when I went to mat them with the scallop ones - I found out that I had accidentally been sold another set of the large and not the small ones! Oops! Well anyway - hope you like the card today! This is such a cute card! I love the moose and the papers feel very outdoorsy. It makes a great masculine card...so maybe I shouldn't call it cute! You card is so stinkin cute!!! I love him, what an adorable face!! adorable card! 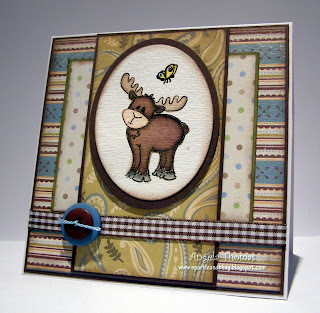 I love the color palette and that moose is just too stinkin' cute! Oh my gosh!!! What a sweet sweet card and great image! Thanks for Playing! Really fun Moose and button. You did awesome on the sketch challenge.